- Sunday's plan was to do a Belknap Range Traverse (Gunstock Mountain through Mount Major). We spotted a car at the Mount Major Trailhead then drove over to Gunstock Mountain Ski area. We gathered our gear when I realized I left my winter windbreaker behind, which on Sunday was not a good thing with temps in the single digits and blustery winds! Then, we couldn't find the start of the Brook Trail. I didn't do my usual thorough research on where the trail started, I had everything else jotted down but that. Next, as we tried to locate the trail Cole was in the midst of skiers and boarders, it was a little nerve-racking! As we looked for the trail Cole ran up to a bunny slope and frolicked around as people skied around him. 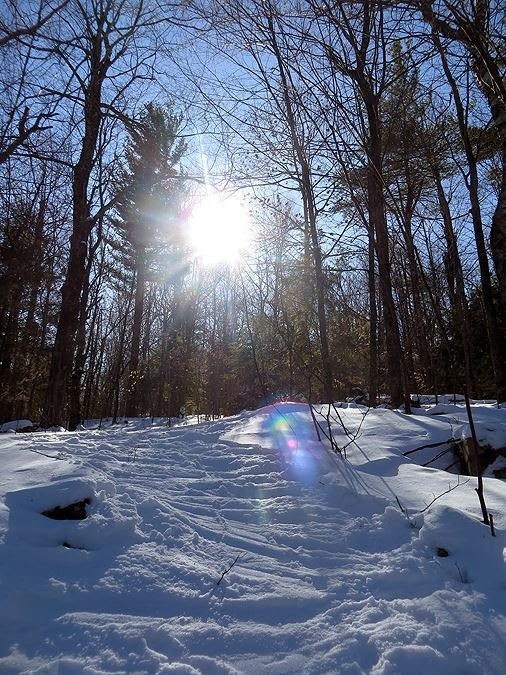 - We eventually stumbled upon the Moose snowshoe path which took us to the Overlook Trail. It ended up being a good thing as the Overlook Trail was really pretty and other than one spot went nowhere near the slopes so we didn't have to worry about Cole taking off. 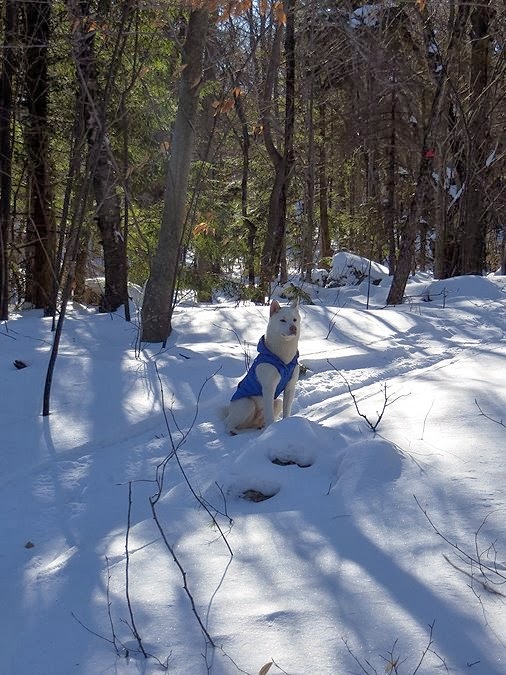 He has a thing for skiers, as in he likes to chase them, all the way down the mountain! - The Overlook Trail was a real nice hike up to the col between Gunstock and Belknap. We headed up to Belknap and climbed up the tower. The little room up top was closed but we still had a great view of Lake Winnipesaukee. I told Alton I wasn't feeling confident enough to continue on, so I suggested we head over to Gunstock Mountain since we missed out on it then head back to the car. 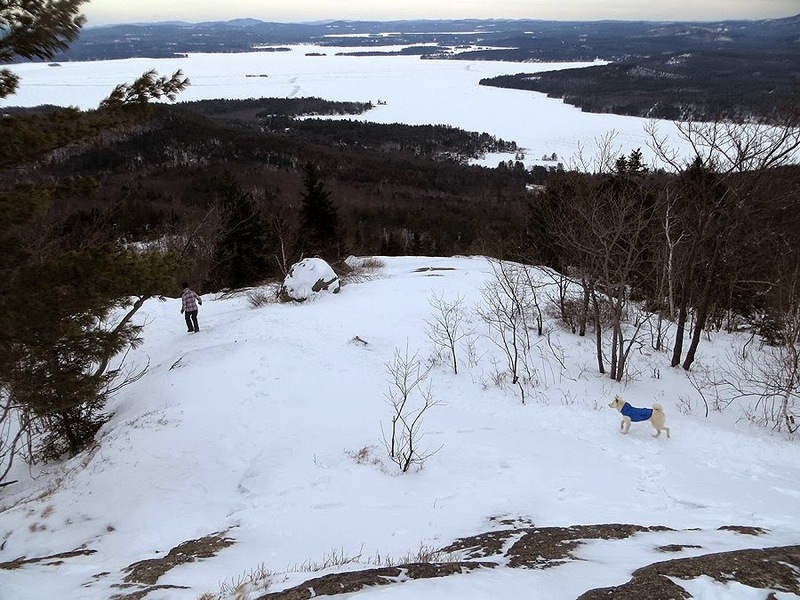 - Cole did well not to chase any skiers as we went up to Gunstock's summit. On the way we also found the top of the Brook Trail but we decided to head back out the way we came so we wouldn't have to worry about Cole running onto the slopes. - We had a quick hike back down to the car and carried Cole through the parking lot so he would go play in the traffic! 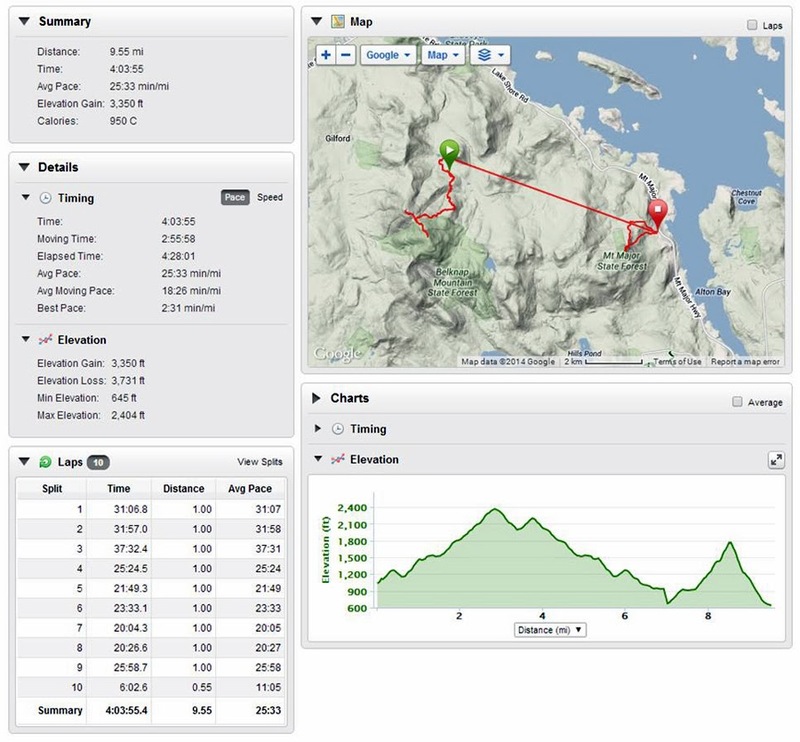 - Alton suggested that we do a speed hike up to Mount Major. We were both chilled so when we got to the trailhead we put on dry layers, warmed up, and took off with no packs up the mountain. It was a fast passed walk up as Cole lead the way all the way to the top. 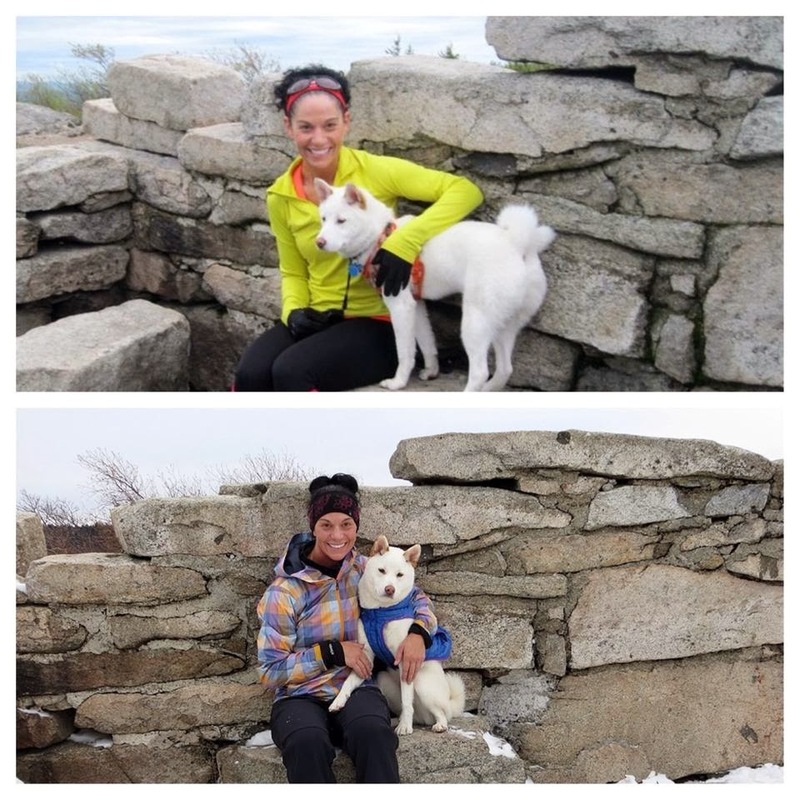 For Cole, it was his return to the scene of his first hike back in May. Back then he could barely cross a stream, had to be nudged to almost pushed up the small mountain. 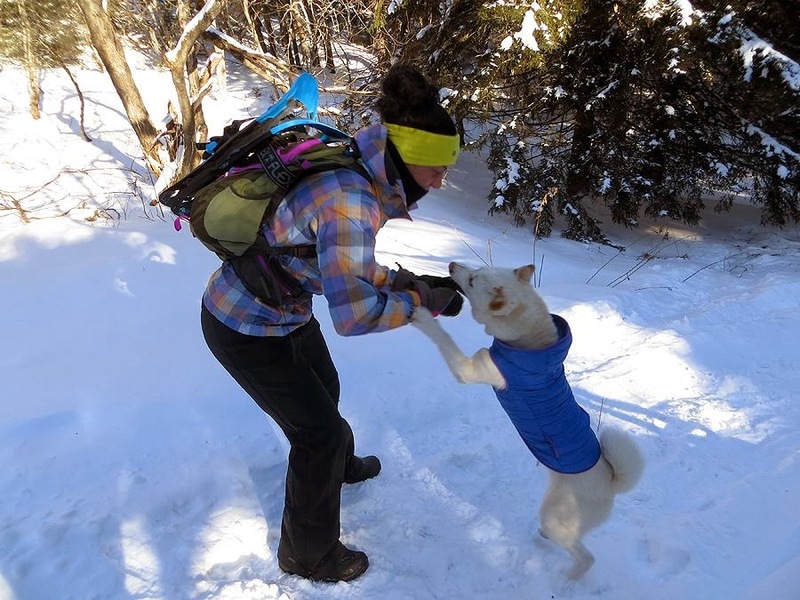 Now, he just runs up with ease and is one of the strongest hiking dogs around! - When we reached the top we took a few pics then booked it back down the mountain. Below the initial ledges we both went off trail and followed other tracks back down the mountain. It was a pretty open bushwhack, Cole followed me down the mountain. Alton was a couple of hundred yards to the right of me, I think, in the end I came out on the Bee-Line Trail about a quarter mile from the trailhead and Alton came out on a snowmobile path about a tenth mile from the trailhead! - It was a fast and furious descent and a lot of fun, Cole had a blast and it ending up being a fun and fitting way to a day where our original plans fell through!